Josh Moore holds the 22-caliber rifle his father gave him for his birthday. The rifle is disguised to look like an automatic assault weapon. Photo courtesy of Facebook. Police and a case worker visited a Carneys Point, N.J., home after a photo of a child holding an alleged assault weapon was posted on Facebook, this NJ.com article said. The headline of several articles identified the social service employee who visited the home as a social worker although the articles referred to the person as a caseworker. 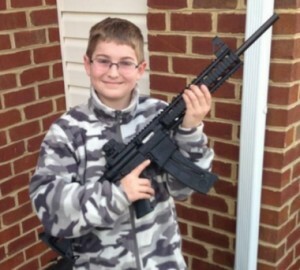 Shawn Moore gave his 11-year-old son Josh a 22-caliber rifle disguised to look like a military assault rifle. Shawn Moore posted the photo on Facebook, which may have prompted an anonymous caller to alert social services. State caseworkers can ask police to accompany them to a home if they believe danger exists, the article said. Police and the caseworker visited the home but left because police did not have a warrant to search the residence, Shawn Moore said. Stupid: Child protection work is as challenging a responsibility as ANY we will encounter. And it is often left to our youngest, least educated and poorest paid peers. In New Jersey, CPS workers don’t even necessarily have a social work degree, although it is preferred. (In fairness, NJ does pay it’s CPS workers surprisingly well.) Understand, I can’t speak for NJ, but in some state’s, CPS divisions also offer internal training programs that seem to stifle or limit individual initiative and professional education. The mantra in such environment becomes: don’t think: follow these rules. I suspect that this visit was a poorly considered response provoked by recent public events and the current firearms / assault gun hysteria. As social workers we need to be attentive to our own dreads and bias’s as well as political influences as we consider our professional responsibilities. If we were to investigate every photo of a minor child holding a firearm, hundreds of other children would certainly be at increased risk of significant harm in our distracted absence. Our CPS work is too important to be done recklessly. Or politically. And although I believe it is essential for social workers to be politically active, including about issues of firearms safety, concealed carry, as well as extended capacity magazines and assult style weapons, such POLITICS must be reasonably insulated from our practice responsibilities. Or we come across looking like the stereotypes that we all dispise. Final point: asking police to accompany the workers to investigate. Worker SAFETY is essential. We are LIBERALS and SOCIALISTS afte rall. (Even when we ‘re not.) So certainly we are out to take guns away now, ( just listen to Fox news) as well as well-disciplined loving children. (When we’re not paying off welfare mothers.) The assault gun / firearms hysteria is so rampant ON BOTH SIDES in this nation that if I was going out to a house where I KNEW firearms were being brandished in public, or to one that was flying the yellow “Don’t Tread on Me ” flag, I too may be inclined to ask for police support. But this instance -based upon whats presented here- just didn’t seem to warrant a visit in the first place. And the accompaniment of armed police had the potential to be seen as an unwarranted threat or escalation. Stupid. Dang. We don’t get paid enough for this work.